The Rockery Suite Self-cateringThe Rockery Suite is one of only six tastefully appointed apartments in an impressive residence called Sawrey Knotts which was built by the magistrate Robert Sowler in 1861. 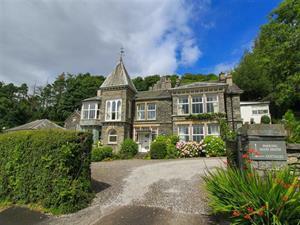 It is within walking distance of Beatrix Potter's fascinating home and museum at Near Sawrey. Situated between Lake Windermere and Hawkshead the front of the house and garden enjoy stunning views towards the lake as it stretches southwards, and towards Coniston Old Man in the west. The building retains the feel of a country house with the main front door opening into a large entrance hall with winding staircase. The house is built into the rocky hillside with the cosy one bedroom Rockery Suite tucked away at the rear of the building, looking up into the rockery garden and the old walled terraced garden fromdifferent windows. It has a separate outside entrance and is therefore private and perfect for relaxation at any time of the year with its original open fireplace and elegant lounge. Walk from the door up onto Claife Heights with its dramatic views, or relax in the spacious peaceful gardens with a glass of wine, a good book, and the beautiful scenery. The ferry to Bowness is a two minute drive and the Cuckoo Brow with its bar and restaurant is only a two minute walk, so when you retire to consider your verdict over an evening drink, we would direct you to find 'The Honourable Robert' guilty on all counts - of choosing this perfect location for his country house! Accommodation: Stairs from impressive entrance hall and into small lobby. Elegant well furnished lounge/dining room has windows to two sides, original shutters, tall ceiling and good sized open fire with original marble surround, cast and tile inset (TV with Sky Freesat, DVD & video, CD/radio, wireless broadband access). Fitted kitchen has everything for your holiday needs. Bedroom has king-size bed and windows to two sides. Shower room with good quality white suite (shower, basin and wc). The apartment is attractively furnished in-keeping with the property with fitted carpets, central heating and many tasteful personal touches. Rear door for private access. Outside: Sawrey Knotts has three acres of shared gardens and grounds with benches, tables and chairs and there are lake views to be enjoyed from the grounds. Coin operated laundry on site. Freezer in laundry room. In addition to this The Rockery Suite has its own small patio at the rear with table and chairs provided. Ample parking. Local pub 4 mins walk. Shops including a well-stocked Co-op and excellent deli, are in Hawkshead - 3 miles away. PLEASE NOTE - the broadband speed at The Rockery Suite is 1-2Mbps and is suitable for e-mail and surfing but not for 'heavy duty' use. Wood for open fire provided October to May. The Rockery Suite is one of only six tastefully appointed apartments in an impressive residence called Sawrey Knotts which was built in 1861. It is within walking distance of Beatrix Potter's fascinating home and museum at Far Sawrey. The Rockery Suite offers weekly bookings starting on Saturday. All bed linen, gas, electric and oil included. Fueld for fire available locally. Free membership to Parklands leisure club. The Rockery Sui offers weekly bookings starting on Saturday.